At around 1 mm, the members of the genus Wolffia are the world’s smallest flowering plants. These tiny green spheres float with the duckweeds on many local ponds. They feel like small round seeds or sand grains. "Watermeal," their common name, refers to the Wolffia’s mealy or grainy feel rather than its edibility. Central New York has three species: W. columbiana, which is transparent green with a rounded dorsal surface; W. brasiliensis, which has a dark green dorsal surface with a conical central papule; and W. borealis, which has a flat dorsal surface with a pointed, slightly upturned apex. Much more info about Wolffia and other members of the duckweed family (Lemnaceae) as well as a variety of photos, including a Thai woman harvesting Wolffia for food, may be found at Mr. Wolffia’s entertaining site. The diatom information that follows will be a mix of science and personal observation. Diatoms are microscopic, single-celled algae that have pretty glass shells. Okay, enough science. When you walk down a creek and slip on the brown slime that coats the rocks and logs, you’ve found diatoms. This slime helps them to stick to the rocks and to propel themselves, much like how a tank travels on its treads. This spring, while shuffling through a slippery creek in Ithaca, I noticed that parts of many rocks sticking out of the water had turned white. Most people guess that this is a lime deposit, sort of like what you see on the insides of old teapots. After all, when our local marl ponds dry up some summers, the Chara, a large algae, bleaches pure white due to the lime (calcium salts) that encrusts the plant. However, a quick look through a microscope shows that the white stuff on creek rocks is largely dead diatoms, or rather their empty shells. 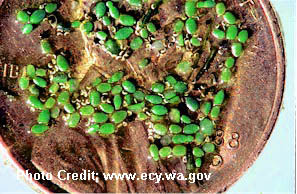 Could the whiteness be partly due to bleached masses of other small plants, bacteria, or lime present with the diatoms? Phycologists, people who study algae, use hot hydrochloric acid to clear diatoms for microscope study of the shell markings. The glass shells resist the acid. I soaked a small creek rock in a commercial lime-removing product. The rock surface bubbled, which showed that the acid was attacking the lime. Later, when rinsed and dried, the rock's white on top/dark below pattern reappeared looking much the same. Under the scope at 100-power, the white rock-scrapings were now a cleaner collection of diatom shells and a few insect parts. My conclusion is that some tiny amount of the white may be due to lime. Could the diatom die-off have started or worsened in the last few years due to pollution? A friend who spent much of his childhood fishing in Central New York assures me that the local creek rocks have been turning white when the water levels drop each spring or early summer for at least the last fifty years. He added that by fall, the whiteness washes off and the rocks regain their normal color. Could the diatom die-off be peculiar to Central New York? In the 2005 movie, Grizzly Man, a bear fanatic finds grizzly poop on creek rocks, feels it and happily tells us it’s still warm. He doesn’t nose through it and show us what the bear had eaten. Despite this oversight, you can see that the Alaskan creek rocks have that familiar bleached look. 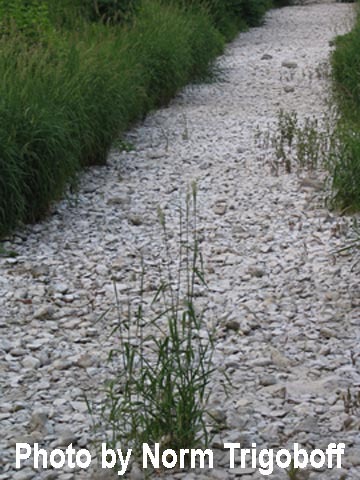 If the diatoms on the tops of creek rocks die each spring, this provides a strong evolutionary pressure for them to live on the lower parts of creek rocks, unless there is some advantage to being higher. Light intensity and dispersal come to mind. Perhaps, diatoms that seek the tops of wet rocks and travel downward as the rocks dry are the most fit. Tiny plants are exempt from the rules of behavior that keep large plants stationary. Wolffia, while not actively motile like diatoms, is driven by water currents and wind. If you want to harvest Wolffia (or small leeches) for food, search the downwind edges of ponds. Diatoms, though abundant in fresh and salt water, have never been harvested for food, as far as I know. But before you dismiss them simply as creek-hazards, keep in mind that they, like Wolffia and all plants, help keep us alive. They release oxygen, absorb carbon dioxide and produce food eaten by the smaller consumers of the food chains.